Typed in Lynchburg, VA on a Hermes 3000, unrelated to the picture below. 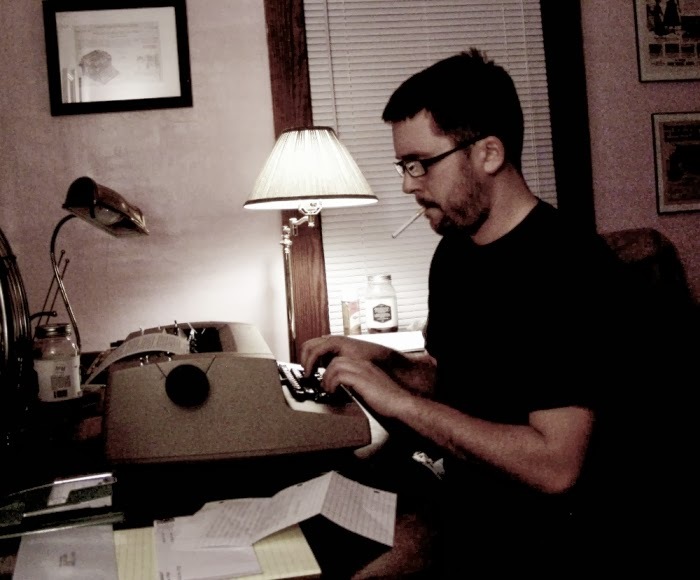 Inspired by classic photos of writers at their typewriters and during a bout of sudden nerdiness I made a self portrait with my 1981 IBM Selectric II. Let be noted for the sake of those concerned (mom for example) that I do not smoke cigarettes but chose a prop to enforce writer stereotypes and make the photo more akin to the types of photos I desired to emulate. Let it be noted for the sake of personal boldness to the potential disappointment of some (mom for example) that is a real jar of liquor on my desk. You look very Hunter S there. And I agree very much with your sentiment. Great photo, and your thoughts (and your friend's) are very well put. We need to stand up to this notion that the only reason one would use a typewriter is to attract attention. 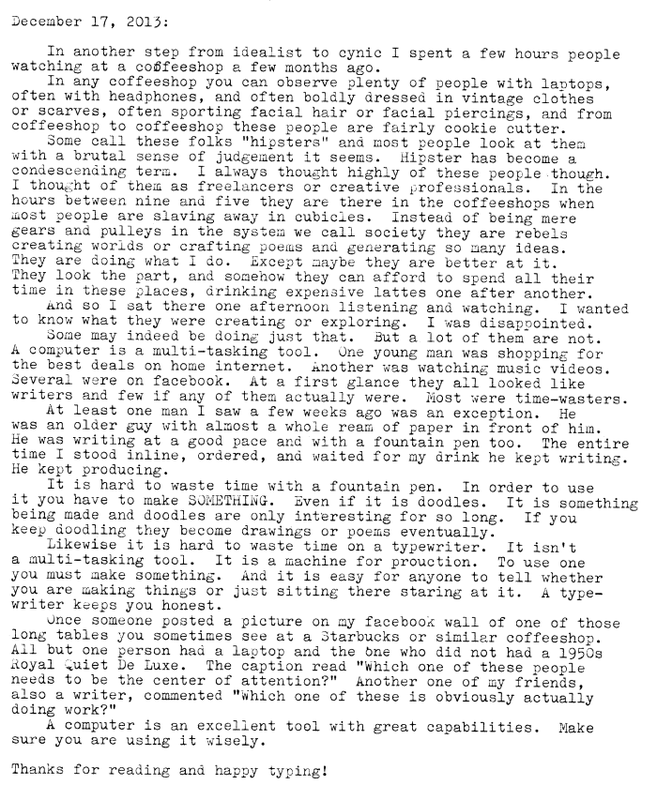 There is inevitably an attention-getting element when one does something against the norm, but in most cases it turns out to be healthy and positive attention: typewriters start conversations and get people thinking about the tools they choose to use. After reading this, and other posts of yours, I agree that I need to go out with one of my portables, and write. This will be at my local health food Coop that has tables to sit at and do this kind of thing. I'm not in a cool hip town with lots of creative, artsy, hipster, writer types, just a little rural farming town. That doesn't matter though, as I'll be the writer type - and keeping myself consistently writing is the important thing. Thanks for the inspiration!! The sepia-tone, the composition, and the subject --- beautiful!! You are an artist.